VeriCite DocumentationUser GuidesVeriCite Help VeriCite LTI Admin HelpHow do I permanently delete a paper from the VeriCite index? From the Admin menu, select Report Lookup. 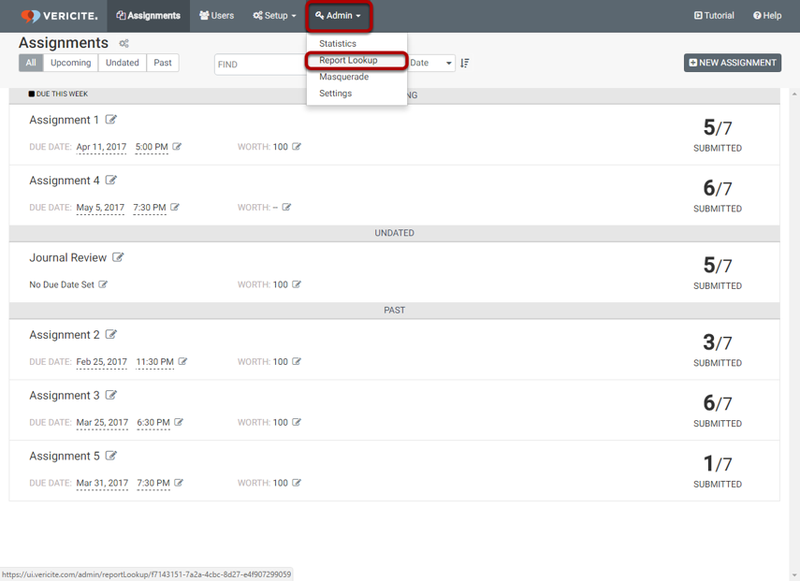 Zoom: From the Admin menu, select Report Lookup. Search for the report you want to delete. Zoom: Search for the report you want to delete. Enter the Paper ID to locate the report you would like to remove. Click the Lookup Reports button once you have entered your search criteria. You will also see the Paper ID, User ID, User UID (or username), First Name, Last Name, Email, Title, Submitted date, Score, SIte, Site Title, and Assignment title for the report. If there is more than one report matching your search criteria, you may see a list of several reports. You will be prompted to confirm the deletion. If you are sure you want to delete, click OK. Note: Papers deleted from the index cannot be retrieved. They will be permanently removed from your institutional index. Prev: How do I look up a report as an admin? Next: How do I view and adjust submission information privacy settings?